The session was organised at Taj Banjara, a well-known Indian Hotels property in Hyderabad. As we waited for the talk to start, we were treated to a couple of select cocktails based on Red Label Scotch whisky. Red Label Mule, a cocktail with ginger ale and a squeeze of lime was the drink I liked. The cocktail had a tinge of tanginess to the overall sweet and spicy flavours. Along with this select finger food was served by the hotel food and beverages. The Calzone served merits a mention here. Rest of the food was kind of pedestrian. The session started after the initial drinks. Tables were laid out tastefully with sample drams of five whiskies and an odd combination of food and other tidbits on a plate. There were apricot, almond, plum cake, honey, black pepper, broken chocolate bits and other things, and I was wondering why they were there. It was then that Hemant Mundkur, Brand Ambassador of Diageo took the stage and rolled out his presentation. Islay and Speyside and the characteristics of the whisky produced in the distilleries in each of the areas. Interesting tidbits how blending became important during the times of illegal distilleries, and how the water of river Spey provides a special taste to the Speyside malt were shared. 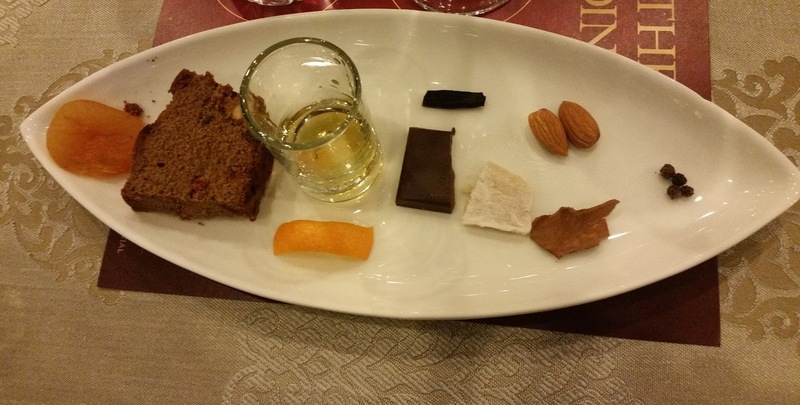 The various aspects of whisky tasting such as colour, texture, nose, leg, palate and finish were also touched upon. 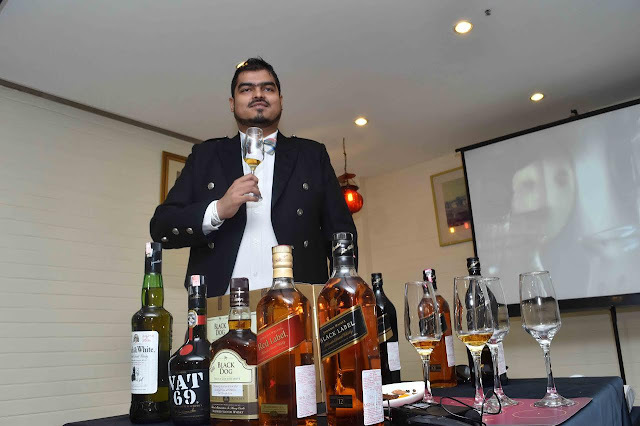 After a basic primer on tasting, Hemant set about analyzing five of the blended Scotch brands offered by Diageo. 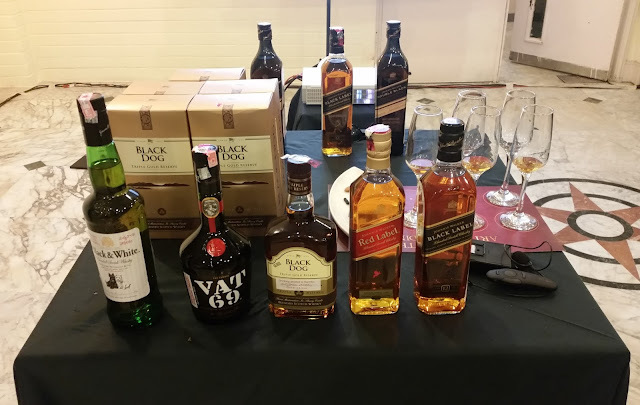 The brands were Black & White, Vat69, Black Dog, Johnnie Walker Red Label and Johnnie Walker Black Label. For each brand, a small introduction was provided regarding the history and heritage of the brand. Participants were then asked to explore the colour, followed by the aroma, taste and aftertaste from a sampler of the brand provided on the table. For example, it was explained that the Black & White provides a distinct honey and almond taste, Vat 69 has a finish of smoky citrus, and the Black Label had the flavour of cinnamon and apricot. It is then that the idea of having the accompanying fruits, chocolate bits and spices became clear to me. We were asked to bite into these right after tasting the corresponding whisky brand, so that we can identify, compare and appreciate the taste better. 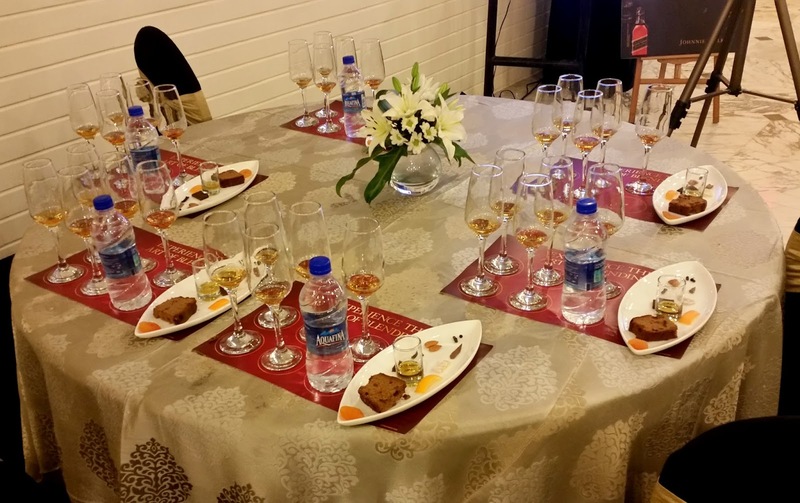 At the end of the session, two of the participants were selected to do a blind tasting of three of the brands. It was a fun idea all the way, with all others loudly guessing the name of the whisky too by simply looking at it. A few guesses were correct, but most were wrong but at the ended both the amateur tasters were rewarded with a bottle of Black Dog each. At the end of the session, the bar was thrown open again to try out all the drinks. The people from Diageo were at hand to answer any queries, and participants had a real good time. I have attended quite a few whisky tasting and pairing sessions and this was one of the better ones. Hemant is a witty speaker and we all enjoyed the small bits of information provided to augment our knowledge and appreciation of blended scotch. It is nice of the company to organise this session, and I hope to see more such sessions on diverse topics like whisky appreciation or food and whisky pairing. 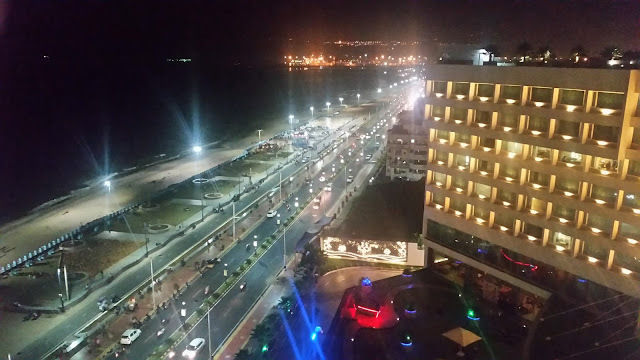 Note: Some pics are courtesy United Spirits Diageo.